Here as per your request, I reaffirm what you wrote in my name several years ago regarding the "Falashas," that it is known what is written in the responsa of the Radba"z, section seven, §9, that it is understood he considers them to be Jews; however for practical application of the law it is difficult to rely on this, for it is not clear if the Radba"z knew well the reality regarding them, nor is it clear whether up until our time their status has [remained the same and] not changed. But in regard to practical application of the law they are not mamzerim or the like, for the Radba"z mentions there that many many doubts apply to them. Review my responsa where I detail at length the qualifications of the rabbinical prohibitions regarding the legal status of 'an illegitimate child of unknown fatherhood' and 'a child found in the street whose parents are (both) unknown'. Regarding their Judaism, we must consider it a safek [doubt], and one must require of them true conversion before we permit them to marry within the Jewish community. Yet even before their conversion it is an active precept to save them from being drawn into a non-Jewish creed and from danger as the law is for any Jew, for "safek nefashot l'hakel" ["a doubt involving saving lives is judged leniently"] even where here the doubt is in their very status as Jews. And I will conclude with the hope that the situation will improve, and in the merit in observing all the mitzvot, we should all soon merit to the ingathering of the exiles by our righteous messiah. * Suggestions were made to bring Ethiopian Jews to Cyprus or Italy (or even the US or Canada) first to fulfill this request, but it proved impossible to do so. I told R. Mordechai Tendler this would not work. His answer based on conversations with his grandfather was to try anyway, which we did, and to note "safek nefashot l'hakel" in the teshuva. In other words, you have to save them no matter what. Rav Moshe wanted to give Baruch Tegegne and I brachot (blessings) to do so and asked us to come to the mountains, where he was vacationing, so he could bless us in person. Illness on our parts prevented this. ** Rav Moshe would later specify a giur l'humra, a form of pro forma conversion that allows conversion without first pushing away the potential converts and without first teaching them Jewish law. He would also later note that the Israeli Chief Rabbis' decision on these matters should be respected. 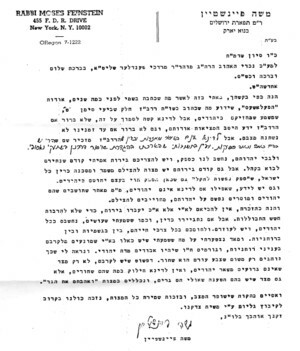 *** Rav Moshe had long before signed a public letter with non-Orthodox rabbis calling for the immediate aid for Ethiopian Jews and for rescue. It is linked here. Rabbi J. 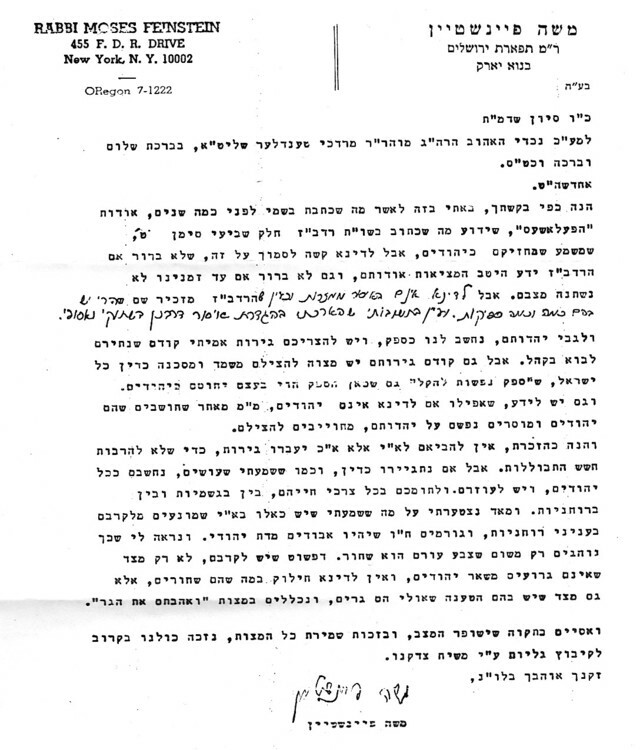 B. Soleveitchik signed the same letter. This is the campaign the late Lubavitcher Rebbe refused to join.